Description: Darcy Stone owes her life to Physical Therapist AJ Colten but that doesn't mean she likes it. Especially after he rejects her when she's at a low point. AJ Colten has already been heartbroken by someone who thought an accident destroyed and defined them. He's not about to risk getting involved with Darcy no matter how irresistible he finds her. Why I Picked This Book: I love the Lucky Harbor books and Shalvis is pretty much an auto-buy for me. My Impression: Shalvis excels at flawed but likable characters and Darcy and AJ are no exception. Darcy reminded me a little bit of Chloe from Head Over Heels but with a lot more attitude. The really great thing is that Darcy really deserves to have an attitude. She's been through a lot. She had a rough childhood and then a fluke accident destroyed the life she had built. She's got an edge and she's defensive but she's not bitter and she's not angry. AJ's hesitation also made sense. He's been down this road before and the results were not good. He also doesn't quite trust that Darcy's settled and not just looking to run. The story starts as Darcy and AJ have gotten to know each other for quite awhile and she has already been through therapy. AJ is also good friends with Darcy's brother Wyatt and sister Zoe so there's a lot of history and a lot of connection already in place. The side characters are also wonderful. I love Xander and Ariana and Darcy's siblings. This town doesn't feel quite as fleshed out as Lucky Harbor felt but it still made for a fun read. I loved the animal connection and Darcy's passion for therapy dogs. That especially comes out in the last 1/3 of the book and really made for some touching moments. This is the 6th book in the series but other than a few mentions of past couples it reads fine as a stand alone. The only problem is that it did make me want to go hunt up the previous books and my TBR pile is weeping as it is! 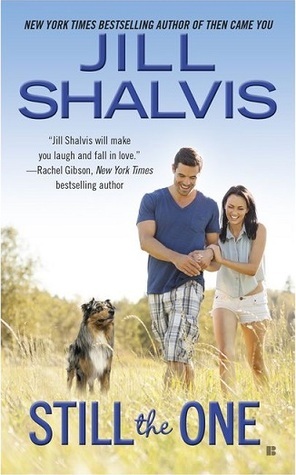 Shalvis is quickly becoming my favorite contemporary romance author and this book didn't disappoint. Would I Read More of this Series/Author? : Definitely! I'm hoping Zoe's story is next and I still have 3 Lucky Harbor books to read. Would I Recommend this Book? : If you like contemporary romances don't miss this or Shalvis in general. Her books never disappoint. I admit to not having read this author despite all the great reviews I've read of her books. I need to remedy this. Do you have a suggestion to which book I should read as my first Shalvis? I liked this one, too, but I also agree that it didn't make me want to rush out and read the others. I actually was kind of curious about Darcy's brother. I'm wondering if Shalvis wrote his story. And I do think that Darcy's sister is next! I have some of her books on my shelf..I have no idea why I haven't read them..because I know I will love them..they are so me. Fantastic review Katherine! I love Jill Shalvis and I can't wait to read this one. Thanks for sharing!! Another great review for this book. I really need to read her one of these days. I keep seeing this one pop up on my Facebook page. I do want to read it at some point. I've enjoyed the other Shalvis' books I have read.